Because I adore Chinese fast food, I am always on the lookout for healthier versions of my favorite food. Well, one day, I came across a vegetarian stir fry recipe that used tofu. I was a bit skeptical, as tofu has never been a favorite of mine. But, to my surprise, the tofu stir fry wasn’t half bad. And it inspired me to create a new stir fry recipe of my own, using some fresh eggplant I had just bought. I was thrilled with how delicious it was! And excited to add another Weight Watchers vegan recipe to my repertoire. Even my 15 month old daughter gobbled it up! 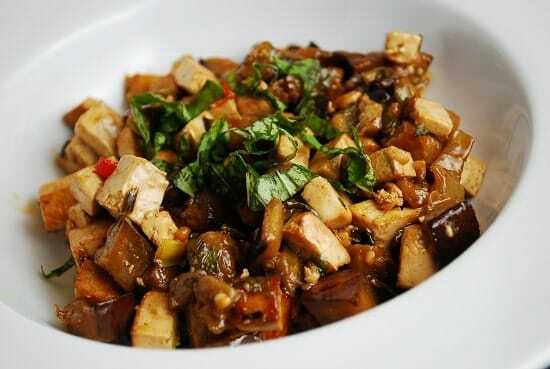 This Eggplant and Tofu Stir Fry Recipe will definitely be made again…it’s now one of my favorite Weight Watchers Recipes. A tasty and healthier alternative to fast Chinese food, this amazing stir fry recipe is flavorful, easy and very satisfying. Serve over brown rice or enjoy as is, and you’ll feel like you are indulging at your favorite Chinese food restaurant. Add in tofu and cook, turning occasionally, until browned, about 8-10 minutes. Transfer tofu to a plate and set aside. Add eggplant, onion whites, Serrano pepper, salt and sesame oil to the pan. Saute, tossing frequently, until eggplant is tender, about 8 minutes. Add in garlic and cook for another 2 minutes. In a small bowl, whisk together soy sauce, vinegar, ginger, and maple syrup. Add into pan and then toss in tofu and scallion greens. Toss gently until sauce thickens, about 2-4 minutes.